Want it by Wednesday 24th April? Order within 10 hours, 58 minutes and choose Royal Mail Tracked 24 Hour at checkout. The Barbour Cirrus Waterproof Jacket is new for SS17 and takes its style inspiration from the classic Barbour Durham. 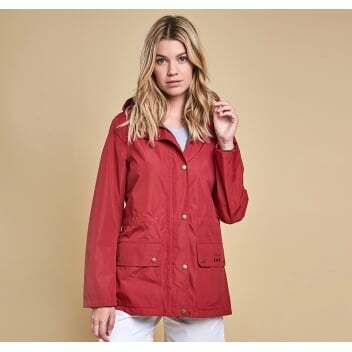 Lightweight, waterproof and breathable this jacket would make a useful addition to any wardrobe. Featuring a detachable hood, a drawcord at the inner waist for a flattering feminine silhouette and stud close pockets which will help keep your valuables safe. The lining features Barbour's exclusive raindrop design which is also printed onto the front pocket in true Barbour style.